2019 is here. The economy is roaring, unemployment is at historic lows, and consumer confidence is reaching new heights. Great news for digital marketers in financial services, right? Yes – but there are caveats. The Fed is raising rates to get ahead of inflation, leading banks’ cost of capital to increase. The media environment is changing rapidly, making the marketing mix more complicated. And a wave of younger consumers – the millennials – is entering the financial-product marketplace, bringing with them new habits and preferences. As we stand at the beginning of a new year, let’s take a look back at how these trends shaped financial services digital marketing in 2018. The first key factor in today’s environment is the rising interest rates. After leaving its benchmark rate near zero percent for seven years, the Federal Reserve began a series of slow-but-steady hikes in 2015 in a bid to limit inflation. The central bank’s strategy seems to be working: Despite a historically low unemployment rate under 4 percent, inflation has come in around 2 percent for much of 2018. Yet, by increasing the cost of borrowing, the Fed is also putting pressure on financial institutions – for which the low-rate environment had been a major boon. Now, banks’ imperative is to hunt down options beyond the capital markets for padding their balance sheets. We at iQuanti are seeing many of our financial-services clients respond to the rise in rates by seeking growth in deposits. Some of the largest banks view this as a major growth area, adding approximately 50,000 to 200,000 new deposit customers in each of the last three years. The primary reason is affordability. Banks want to lessen their reliance on the money markets, making core deposits – which offer a substantially lower cost of capital – extremely attractive. At the same time, financial institutions are facing major shifts in the way consumers engage with media. Cable and satellite TV subscriptions plummeted in the third quarter – a trend that appears to be accelerating. While people of all ages are “cord cutting,” the youngest consumers appear least likely to pony up for a monthly TV subscription. Only one-quarter of consumers aged 18 to 34 default to live TV. What this age group prefers are the many other options available: Instagram, Twitch, YouTube, and others. This shift to digital is impossible to miss in the banking and financial services sector. Online-only banks now draw 12% of new deposit accounts, 3x their volume in 2006. And McKinsey projects that by 2020, 40% of financial products will be purchased on a digital channel. Some of our clients are responding to this shift by investing more in organic search, historically an underinvested channel for financial-services marketers. A typical large bank may spend $20 million annually on paid search, and just a few hundred thousand dollars on SEO – even though organic links draw 75% of search users’ total clicks. We generally encourage banks to reconsider that ratio, in light of how search adds value to every stage of the consumer’s path to purchase. While we make this argument, some financial institutions are seeking growth in another direction: offline. Capital One’s Cafe concept shows how this can work. While the cafes are not full-service branches, they offer a kind of “digital concierge” service, in which advisors help guests navigate financial-product purchases on in-store kiosks. They also serve coffee – a nod to the idea, popularized by Starbucks, of a “third place” that’s neither home nor work. Importantly, Capital One’s Cafes aren’t supplanting either the digital or branch sides of the bank’s business. It’s more of a complementary effort, in which the consumer is acknowledged for moving between on- and offline channels. Expect this model to be replicated in the months and years to come. 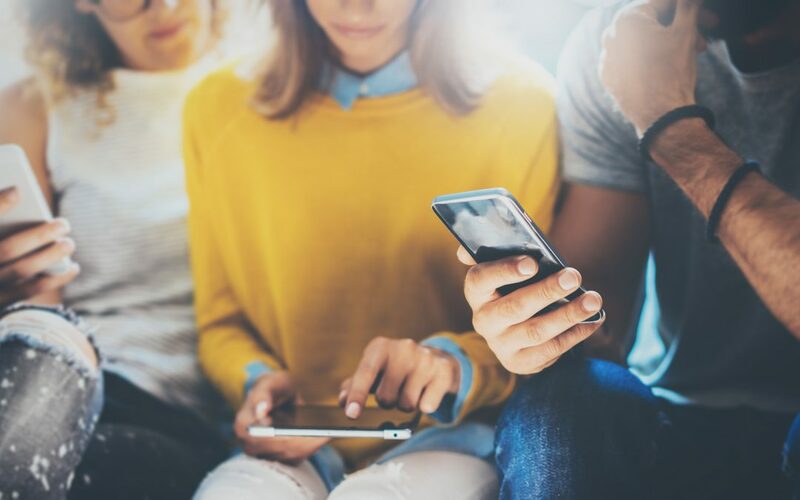 Apps and compelling digital experiences will continue to matter for some consumers – especially Generation Z, who are just beginning their journey into financial independence – but branches will attract visitors, as well. And new hybrid concepts like the Capital One cafe will appear, perhaps with different levels of service. On the service front, we are seeing early efforts involving artificial intelligence for chatbots and AI-assisted support. Will this come to impact marketing? Perhaps – although it’s early days for AI in most areas of financial services. Regardless of the pace of AI adoption, expect both acquisition and servicing in financial services to continue moving in the direction of digital. It’s a brave new world out there for marketers. Are you prepared for what 2019 has in store?